Scholars and critics too initiate “transpositions.” Even a casual observation can make a familiar poem appear in a new light, for example when Helen Vendler wonders, in her review of Wallace Stevens’s Selected Poems, what we would make of “The Snow Man” if it had been called “Stoicism in a Failed Marriage.” Sometimes such interventions go further, transforming our ideas about not only what a poem means but what it does and even what it is. This happened to me many times when I was reading Don Bialostosky’s How to Play a Poem, recently published by the University of Pittsburgh Press. An experienced scholar and teacher of poetry, Bialostosky appreciates the importance of close reading, a strenuous yet rewarding exercise that focuses on elements of structure and language. He also appreciates the usefulness of reading poems through the prism of biography, history, and culture. But for him all that is secondary to the notion of poems as “utterances designed and packaged for pleasurable reanimation.” Hence, what he recommends is a wholesale change in how we read poems or, more accurately, what we do with them. As he argues, “We play poems as we play pieces of music. We play poems as we play games. 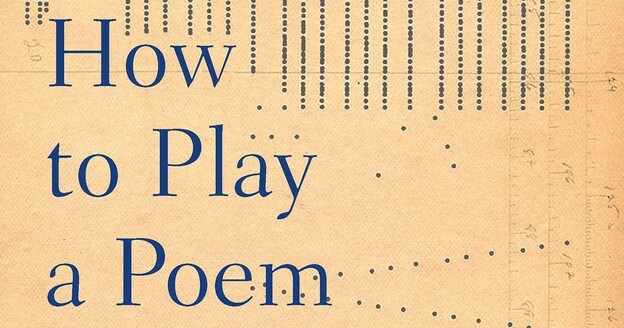 We play poems as we play parts in plays.” To extend just the last part of Bialostosky’s analogy, a poem can be viewed as a script for a stage performance, a fragment of a play that waits to be activated by an imaginative reader — or ideally a classroom of such readers. The originality of Bialostosky’s method becomes apparent when we contrast it with close reading, especially the kind that combines formalist analysis with cultural commentary. One of the poems in Break, Blow, Burn: Camille Paglia Reads Forty-Three of the World’s Best Poems (2005) is “This Is Just to Say” by William Carlos Williams, another modernist classic. In the course of her discussion of what she calls “a highly original love poem,” Paglia comments on its shape (“narrow”), tone (“smug”), pace (“short, halting”), but especially connotative diction. The kitchen is both “female space” and “Eden”; the wife is both “Eve” and the “angry deity”; the plums are “a makeshift proxy for the opulent female form” and “forbidden fruit”; even the icebox is “a two-tiered fortress.” In addition to the Book of Genesis, she identifies allusions to the story of Jason and the Golden Fleece, Petrarch’s sonnets, and Donne’s “The Flea.” According to Paglia, “This Is Just to Say” invokes “mythic patterns of sin and desire; female secrecy and fertility; and male aggression and violation.” Her reading is compelling, and certainly sensitive to the poem’s ambiguity and complexity. But perhaps because it is so persuasive it has the effect of foreclosing other interpretations. Paglia bases her formalist analysis on the concept of art as defamiliarization (Victor Shklovsky’s dictum that art exists “to make us feel things, make the stone stony”). She treats poems as objects made of words; and as she looks at the words, and through the words, she brilliantly demonstrates how Williams’s treatment of the subject enhances the statement being made. Building on M. M. Bakhtin (especially his essay “The Problem of Speech Genres”) and V. N. Voloshinov (from whom he borrows the speaker, listener and topic/hero triad), Bialostosky approaches poems as utterances that incorporate, and often transform, primary speech genres: “always familiarize the speech genre(s) of the poem,” he maintains, “before you defamiliarize it (them).” As he looks at the words, through the words, and even around the words, he pays close attention to the rhetorical situation and in the process opens new, unexpected avenues for interpretation. Especially when contrasted with close reading, which even when done well tends to curtail possibilities, Bialostosky’s “rhetorical” approach shows us how to read poems with more freedom — and more fun.